Will we continue to be silent? That same day in March 1911, the Triangle shirtwaist factory fire killed 146 young women in New York City. Much like workers in Bangladeshi garments factories, the young women worked in sub-par conditions that included being locked during working hours, low wages, long hours, cramped spaces. And when the fire broke, they had no escape. Many jumped out the windows and died, choosing not to burn to death. And much like the Bangladeshi garments factory workers, they were among some of the poorest individuals in the country: working class Eastern European immigrants. However, unlike Bangladesh, where factory fires like the Triangle fire is commonplace, a host of changes in safety laws occurred in response to the fire; the Triangle fire sparked a movement by labor groups that seized the moment to demand reforms that would change workplace environment in the United States for good. Among such labor groups were the International Ladies’ Garment Workers’ Union, I.L.G.W.U., which represented skilled garment workers in the 1900s, and the National Women’s Trade Union League (N.W.T.U.L. ), which was a group of middle and upper class women. The League was instrumental in disseminating questionnaires about workplace safety conditions to factory workers to understand their grievances and then presenting their grievances at a rally in New York City (The United States Department of Labor, 2013). Their call for help did not fall on deaf ears. Instead, it led to the creation of a Factory Investigating Commission that was responsible for assessing workplaces in New York. In addition, the Bureau of Fire Prevention was created, which required stairwells, fire alarms, extinguishers and hoses to be installed in all factories. The following year, eight bills were passed by the legislature that addressed safety issues in the workplace including: sanitation, minimum age of workers, and workplace injury. In 1913, the Factory Investigating Commission suggested 25 new bills to mandate buildings to have fire escapes, fireproof stairways, as well as regulations that would enable them to inspect all multistoried buildings for safety. In 1916, smoking was also outlawed in factories as a fire hazard. In the 1930s, many of these provisions were mandated on the federal level (United States Department of Labor, 2013). The Triangle factory fire is reminiscent of the Tazreen Garments factory fire that killed 112 workers in Dhaka several months ago. Amidst locked doors and the absence of fire exits, young women jumped to their deaths or burned to death, as factory supervisors disallowed workers from leaving the premises even after fire alarms went off (The New York Times, 2012). 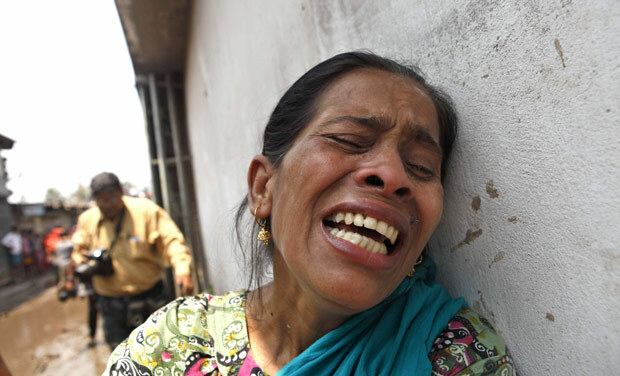 In response, the Bangladesh Garment Manufacturers and Exporters Association (BGMEA) had announced plans to expel 850 factories from its membership due to noncompliance with safety and labor standards. However, there were no changes in legislation that ensured safety for factory workers. There were no Leagues or worker groups that were outraged enough to demand changes in legislation that would enable workers to work in humane conditions. The question of the day is, perhaps, why? The middle and upper class women in the United States battled for poor immigrants a100 years ago. Their movement sparked the changes that we see today. But why are we silent? Where is our civil society? Why is it that we can only speak on social media about it, why is it that we can write op-eds about it, but we still do not see actual change? Why do we not hold accountable the people who own such businesses? Why do we not hold accountable the engineers and architects and their work ethics when they build such factories without thinking about something as basic as safety? Why is it that we do not hold accountable the lawmakers who should have worked this out a long time ago? Is it because we are somehow related to those in power, and we don’t want to burn bridges (and so we burn factories)? Is it become we know those who own these businesses and we want to remain friends with them? Is it because we simply do not care in the long run (because in the short run, we care enough to write about it)? Or is it because we know that we really have no say? Is it because we know that we can demand change, but those demands will not get met? Is it because we have no real power to change legislation that would negatively affect the rich? Is it because Bangladesh really belongs to other people – those with political power and those who can buy political power? While rescue efforts by the army and firemen continue with inadequate machinery and the love of the local people who are helping them save people, the death toll keeps rising. So far, 142 have been reported dead and 1600 injured (The Daily Star, 2013). Reports indicate that there were warning signs, including a crack in the building that caused an evacuation the day before. Workers were apprehensive about returning to work the next day, but were forced to by garments factory owners. The Home Minister has cited ‘faulty construction’ as the reason for the collapse (The Daily Star, 2013). But no one has said a word about how such a building could become a factory employing 6000 people. There is yet to be an announcement about setting up a factory inspection commission that would ensure workplace safety for the some of most hard-working members of the labor force in the country. Stein, L. (1977). Out of the sweatshop: The struggle for industrial democracy. New York: Quadrangle/New Times Book Company. United States Department of Labor. (2013). The Triangle Shirtwaist factory fire. Retrieved on 4/23/2013 from: http://www.osha.gov/oas/trianglefactoryfire.html. Your article is a refreshing read. However, why choose the picture of the jeans? Correct me if I am wrong, but it does not reflect the content of your article. The system is the problem right? not the industry that accounts for a significant percentage of our GDP? that picture will simply discourage foreign buyers and hurt us in the long run. 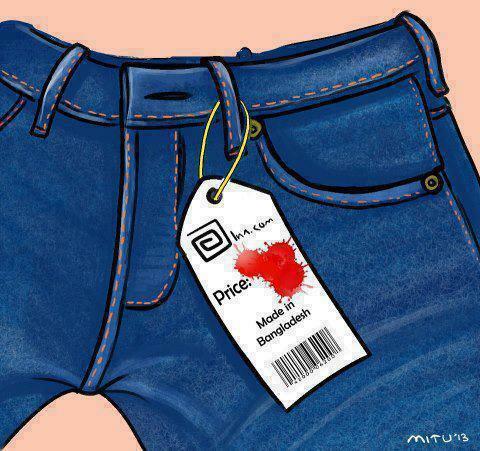 This image simply leaves one with a distaste for products made in Bangladesh, one of the few products our labor force is skilled to produce. It serves to challenge livelihoods of the same people it seeks to protect. Point taken. Thanks for your comment.